Samsung recently released Galaxy Note 5 & Galaxy S6 Edge Plus at their Unpacked event last week. Samsung even took a moment to show the Official teaser for their upcoming smartwatch Gear S2 releasing next month at IFA, Berlin 2015. Ever since that video was released by Samsung, there's lot of excitement that's going around the internet. Watching the video reveals that, it's definitely not an android wear device & seems like tizen OS might be tossed on it, however did you noticed that spinning wheel(Metal Band) around the display ? Let's find out more, about it. So Gear S2 has been officially teased, which will be unveiled on Sept 3rd, 2015. 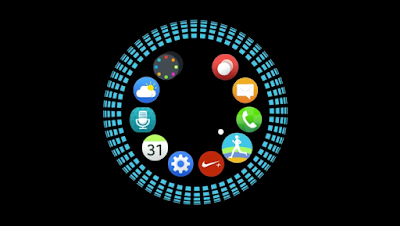 Video reveals some nice colour palettes introduced in the Gear S2's user interface, what we've already seen with Android Lollipop. Lollipop matches the theme colour of the app to your surroundings. 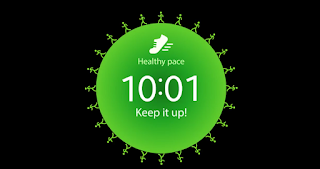 So the interface reveals several apps running in a clock like circle-launcher which has many apps like a weather app, stopwatch, dailer app, S-voice app, a time zone app, sports tracker, heart rate activity tracker & who knows even more. The video makes it clear that it houses a heart rate sensor, pedometer & some awesome watch faces. Even the icons are rounded, part of which the touchwiz UI is also receiving those changes with latest builds. Well that's about the interface, now let's speak about the design. Apple watch has a digital crown which can be used to move within the interface, likewise if you watch the video closely Gear S2 seems to have same mechanism, but this time it's around the display. Watch the video again, The Metal band surrounding Gear S2's display actually rotates when the switch is made from apps within the launcher OR watch faces in the end(Video). 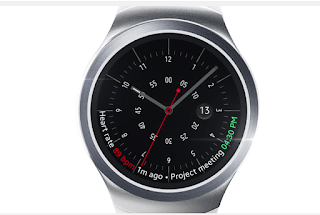 Guess what even Samsung has teased it in the video description , "The new Samsung Gear S2 is coming. Ready to turn. " Fun Fact : I'm damn sure this is about to happen, prove me wrong. Samsung clearly shows it. Apart from that it's hard to predict anything about the specifications, but hey September is not too long away. I'll prefer to stay low, instead of predicting specs on the fly. You better watch out Apple, Samsung's coming. However it is unclear whether the Gear S2 runs Tizen or Android Wear, Because who knows Samsung might've created their own launcher or even a customized version of Android, just like they had made one before Android Wear was a thing. So it's exciting to see such products coming, what are your thought ? Feel free to share it in the comments section below. Also See : Samsung Galaxy Note 5 : Everything You Need To Know.